Strikeforce ended months of speculation regarding Fedor Emelianenko’s future with the organization when they finally announced this morning the Russian would meet Fabricio Werdum on June 26th. With the heavyweight scrap officially set for the HP Pavilion in San Jose, California, Emelianenko took a few moments to address his fans regarding his impending foe. Today I am happy to announce that I am going to fight Fabricio Werdum at the HP Pavilion in San Jose, California on the 26th of June! The fight will be live on Showtime. I finally have a chance to stand across the cage from the man who beat my brother, and to make that loss right. Strikeforce and M-1 Global, the Russian based company that manages Emelianenko, have been trying to renegotiate the three-fight contract they had agreed upon less than a year ago. 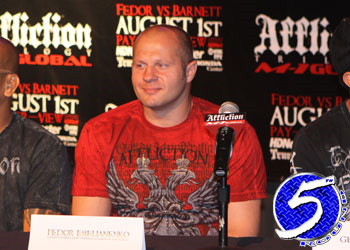 Although neither side addressed what concessions were made to the original deal, it appears it was enough to please Team Fedor.